Stampin' Up ideas and supplies from Vicky at Crafting Clare's Paper Moments: Cards for the cave man in your life! Cards for the cave man in your life! My ikat design was stamped in gorgeous, earthy colours that a cave man might have daubed with - and it's definitely got a primal cave art feel, don't you agree? I mounted it with dimensionals on a piece of Soft Suede card stock and placed a panel over the top with an aperture cut into it using one of my square framelit dies. Cutting the aperture slightly larger than the ikat design creates a 'reveal' (ie it allows you to see a border of the Soft suede mount.) I'll be linking this card up with Less is More where the theme this week is Die Cuts. When making the first card I had cut a piece off my stamped ikat panel, so I thriftily made a second card with the off cut. This time I mounted the ikat on top of a piece of core'dinations card stock. What do you think of this cute little embellishment? I used my Essentials piercing template to make four holes and threaded linen twine through it in a kiss :) Since this card was made with bits and bobs, I shall link up with Pixie's Snippets Playground. • Eyecatching Ikat is one of three gorgeous photopolymer stamp sets you can choose as a free gift - get one with every £60 you spend! Offer ends TOMORROW and these sets won't be available after that! Click here for details. I'm too excited to say and chat today because I'm so big with news I could burst! All will be revealed tomorrow so do check back here then! It certainly suits the colours you chose! Great colours and style, loving the mini embellishment too. 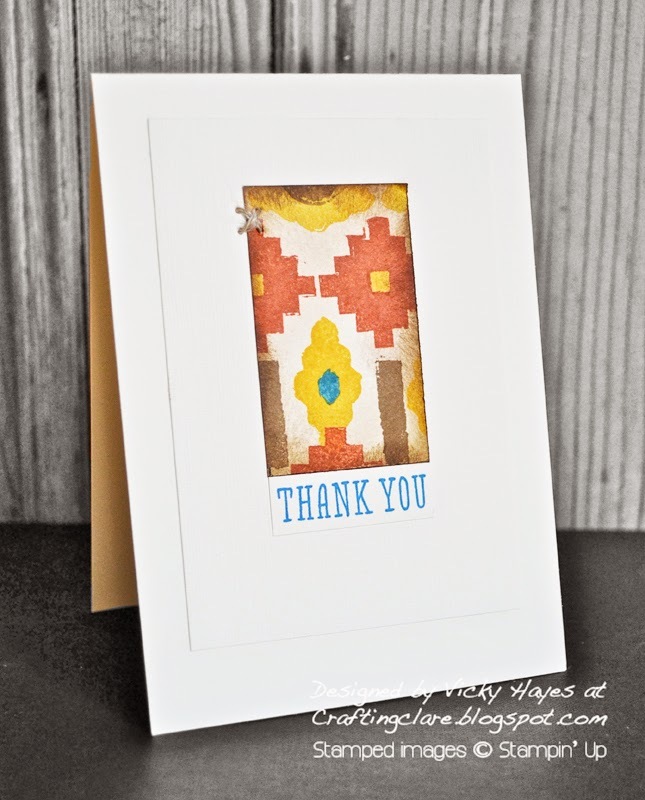 Your Ikat stamped background is gorgeous - looks like fabric - and I love the colours. Can't wait to find out your news!! Gorgeous cards Vicky - and genius to add the little kiss! What a super creation Vicky!